Rubber Dance Blog is hosting a color challenge and Art Journal Journey theme for September is Living Beings. I think this card will cover both of those. That darling bird was designed by my friend Jana Bodin for Rubber Dance stamps. I stamped her on book text and stippled with Maroon Color Box Chalk Ink. The leaves stamped using Color Box Chalk Ink are also Rubber Dance stamps. I really like how clearly the veins show up in the leaves. The limb is cut using the Tim Holtz Bird Branch die. I used Dimensional Magic on the bird to give her a bit more depth. What a lovely page - I am just working on a page for the Rubber Stamp Challenge at the moment and hope to come up with nearly such a great result like you did- so so beautiful! What an adorable card, Boo! Thank you for joining our color challenge this month! 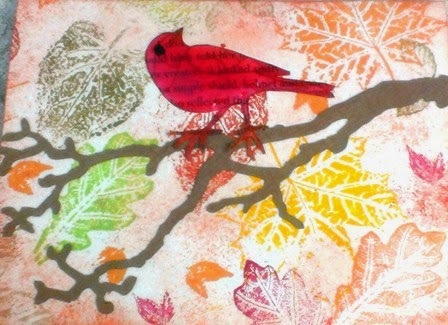 Love your red bird on the branch and the stamped leaves are cleverly done. Lovely card Boo! I love those colours, esp the red for the bird just pops! Awesome - love the bird! Thanks for joining us at Rubber Dance! Thanks! I feel so welcom. Your stamped leaves look like you used the real thing to get such great veins. I love that leafy background Boo it is the perfect foil for that crimson bird! Thanks for joining in the fun at Rubber Dance! Really quite gorgeous Boo! Thanks for sharing all the steps you used!! Very beautiful! Love that bird! Thanks so much for joining our first challenge at Rubber Dance Stamps!